In this column, we interviewed Marie Ross about The Fidelio Podcast, her twice-monthly podcast about topics in the arts including early music and period instruments. Dr. Ross is a historical clarinet specialist and arranger living in Germany. She is associate principal clarinetist with the French period-instrument orchestra Ensemble Matheus, and performs regularly with various other historical orchestras including Concerto Köln, MusicAeterna and Akademie für Alte Music Berlin. You can listen to the podcast at http://FidelioPodcast.libsyn.com and access more information including tons of photos of Marie and her guests on the podcast's Facebook page. Clarinet Cache: Why did you decide to create The Fidelio Podcast? Marie Ross: This is a big question, with a few different answers! I went to high school at the Interlochen Arts Academy, which is a school for many artistic disciplines. It was great to be around not only other serious musicians my age, but also kids who were pursuing careers as dancers, visual artists, and actors, etc. Fifteen years later, having gone into the highly specialized world of early music, I started to miss the different conversations with artists outside my discipline. I find these are often the kind of conversations that can open your mind to new ideas and give you fresh inspiration or a new approach for your own work. I also remembered when I was a student I would hear recordings of historical performance, but I had very little idea of what it really was, how those musicians got involved in it, or how they were working. It turns out that being a historical performer is very different from life as a mainstream modern classical musician. I wanted to describe some of these things to people and to share my own experiences as a historical performer. 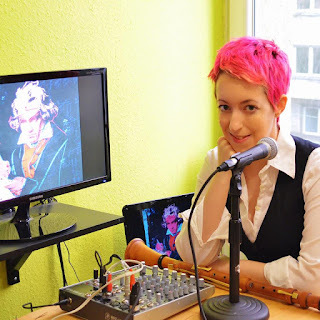 Audio is the best medium for me to do that – I’ve been in love with radio since I was young – and podcasting itself is a revolutionary movement like early music! CC: The show features guests with diverse backgrounds. How you do select guests? MR: I always choose artists whose work I love, who have inspired me, and who I’m excited to share with other people. Many of my guests work at various different artistic endeavors, like Michael Walters who was transitioning from being a ballet dancer into an actor, or the Steindler sisters who are both baroque violinists and fashion designers. I started out interviewing friends, amazing artists that I’ve met in my life and who I knew I could count on for a fascinating and deep conversation. Then I started interviewing the artists I was lucky enough to be working with, world-class singers and conductors. And now, as in the case of long-time Simpsons director, Mark Kirkland, incredible artists are starting to find me. He had heard my podcast, gotten in touch, and now after we made a couple of great episodes about his career in animation and his own projects as a filmmaker, I consider him a good friend. CC: What are some of your favorite clarinet guests or topics covered? MR: When I started the show, I wanted to establish that it wasn’t a clarinet show – or even a music show – so I actually avoided having too many clarinetists as guests in the beginning. I did interview Luigi Magistrelli about his set of late Romantic German clarinets owned by Dieter Klöcker. Luigi shared so much information about the instruments, but also made a point to talk about his relationship and respect for Klöcker, even mentioning how he can still feel Klöcker’s sound in the clarinets when he plays them. That interview was a part of two episodes I did with my early music colleagues about the stories of their favorite original historical wind instruments. I’m a huge opera fan, so I love interviewing opera stars. What’s fun is that usually I end up talking to them about playing clarinet, and we start comparing singing with being an instrumentalist. The episodes I make myself without guests are all special to me as well. One of my favorites to make was about my experience playing a whole season just of Rossini opera, and how that changes you as a player. I did a lot of research about Rossini and the Italian opera world of the time, and compared it with the opera productions we make today. It was fun to see how hectic and chaotic musical life was then, and how not much has changed. CC: Your podcasts are interesting and informative from a historical perspective. What kind of audience does your podcast reach? MR: Making the podcast has been an incredible experience because I’ve reached such a wide audience. I’ve made a lot of friends with people who have heard it and gotten in touch on social media. Because of the podcast, I’ve been in contact with Irish poets, Broadway theater fans, art students, Los Angeles filmmakers, James Joyce scholars, all kinds of musicians from around the world, and of course just regular people who are interested in the arts. When I make an episode or an interview, especially with musicians, it can be tempting to get too technical or too much into detail that only other professional musicians would understand, but I try hard to avoid that. Each time I make an episode, I think specifically of three people who I know are out there listening: a 15 year-old girl in Paris who is studying piano and found me from my first episode, an amateur footballer in Indiana who has an office day-job and told me that he has become more curious about culture since finding my podcast, and my mom – who still knows very little about music, but will listen if I explain things to her. Having them in my mind helps me keep the content clear and accessible. CC: What are your future plans for the podcasts? MR: I plan to start having more clarinetist guests. I am looking forward to doing an interview soon with Frank Cohen among others. Otherwise, I’m just planning to keep meeting interesting artists who show me how all the arts are connected, and to use it as a platform to talk about what we do as historical performers. CC: Do you have any new performance projects lined up? MR: Yes, I’m very excited because in 2016 I will be putting together a wind octet made up of the best historical wind players from all over Europe, a kind of “dream team” to play in the Concertgebouw Brugge. Classical-period wind octet music is my topic, so I’ll be talking a bit about my research and playing my own arrangements with the group. I also have a new Rossini opera coming up with Ensemble Matheus, and the “Folle nuit” concert we do, which I want to make a podcast episode about. It means “crazy night,” and we play all kinds of music all night long from 7 PM to 7 AM. We play our symphonic and operatic repertoire, but then different groups of musicians also play solo repertoire, jazz, rock, and last year we even had an orchestral “karaoke” concert where people from the audience came up and sang opera arias with us! It’s totally insane and ends with a huge breakfast with the audience in the morning. CC: And lastly, what is your favorite clarinet to play on? MR: That’s a difficult question. Some days I think it’s my 10-key late Classical clarinet which is probably the one I play most often, some days I think it’s the basset-horn, and sometimes I definitely think it’s one of the Oskar Oehler late Romantic clarinets. Actually I think I’m a lot like my friend Alexis Kossenko. I asked him to bring one of his favorite flutes to talk about for my episode about instruments, and the next day he came to the theater with five flutes from different eras, because there was just no way he could choose one. So we sat backstage before our performance, and he demonstrated all of the flutes for me and told me about each one, which I later made into a whole episode! In this column we took a look at clarinet chamber ensembles with interesting resources on the Internet. Using the listing of ensembles at the clarinet.org “Links” page along with other sources, we came up with some standout groups that have good audio files and videos online, and may help you discover new repertoire for small clarinet ensemble. In our research for this column we came across Carolina Clarinet Quartet’s website and were impressed by the amount of information located on their page. The PDF file of their music library covers over three hundred clarinet quartets and many entries include timings and brief remarks on each piece. Several of these works have been arranged by Carolina Clarinet Quartet’s founding members Brent Smith and Jim Williams and are available for purchase on the site. Over half of the entries contain audio samples and recordings made by the group, allowing visitors an opportunity to hear excerpts of pieces. These recordings, coupled with the practical annotations, are a great resource for those wishing to expand their knowledge of the genre’s repertoire. Also found on the website is a list of the group’s favorite compositions to play and a link to Smith’s informative article “Clarinet Mouthpiece Materials.” Another useful component of the website is an extensive index of clarinet quartet organizations, searchable by both name and location. Despite the index page not being updated for over two years, this list provides further points for exploration of clarinet quartets, and provides links to their websites. The Chicago Clarinet Ensemble is a group made up of both professional clarinetists and gifted younger students from the Chicago area. With a flexible approach to instrumentation, the ensemble’s membership ranges from two players to thirty-five or more musicians. Many of the group’s performances have featured guest soloists such as Stanley Drucker and Anthony McGill. Founded by Rose Sperrazza in 2007, the ensemble is in residence at Northeastern Illinois University. Aiding in the promotion of new music, the group has commissioned eight new works and even has a composer-in-residence, Leo Schwartz. His newest compositions are listed on their website, including audio and video footage of two of his works. Visit their website to learn more about their core members, current events and performances, and hear live performances by the group, including a work for clarinet choir and synthesizer. Clarinetes Ad Libitum is a Portuguese clarinet quartet with percussion, performing folk and traditional music of a variety of cultures. The videos on their website show their affinity for theatrical performances -- they often utilize percussion and vocals, and extramusical elements include a fog machine and removal of shirts onstage! You can also stream their entire album “Contradanza” via their website: a good place to explore clarinet quartet repertoire off the beaten path. The clarinet quartet Ensemble 54 (Josh Kovach, Pascal Archer, David Gould and Nuno Antunes) doesn’t have a ton of information on its website, but they they have a Facebook page and YouTube account where you can find some great videos of their repertoire. These video performances include works by Tomasi and Farkas along with less traditional fare, like a work for clarinet quartet and solo ocarina, and even a duo arrangement of Tchaikovsky’s “Dance of the Sugar Plum Fairy” for A-flat sopranino clarinet and contrabass clarinet! The Farallon Quintet from the San Francisco Bay Area is a unique chamber group that solely performs clarinet quintet (clarinet plus string quartet) repertoire. The group was founded in 2012 and all of the quintet members are active musicians performing in the Bay Area. Clarinetist Natalie Parker is also principal clarinetist of the San Francisco Ballet Orchestra. The quintet’s repertoire is not limited to the standard works and they have worked with a handful of composers to commission and premiere new works. They also play lesser-known compositions such as film composer Bernard Herrmann’s quintet Souvenirs de Voyage, which can be heard on a video on their website. The ensemble’s website includes a blog that allows the group to expand upon their musical mission and to highlight new or unknown works and their composers. One blog post alerts viewers the large volume of works found on Earsense, an extensive chamber music database, which currently lists 169 compositions for the genre. This database is a terrific starting point for those researching or looking up chamber music with various instrumental combinations that include the clarinet. Turning to literature for clarinet duo, the website of the Duo Gurfinkel is a great place to start. These twin brothers from Israel, Alexander and Daniel Gurfinkel, were born in 1992 and by the age of 12 were performing as soloists with Zubin Mehta and the Israel Philharmonic Orchestra. The duo’s website has some great performance videos along with a handy repertoire list including works for two clarinets alone, two clarinets with piano, and two clarinets with orchestra.